Nashville, TN, March 20, 2018 –(PR.com)– Nashville is discovering what Las Vegas, Dallas and Miami already know: When the gelatin shots come out, the party gets way more fun. Jevo gelatin shots are now being served in Nashville’s Swingin’ Doors Saloon, Nudie’s Honky Tonk, Dawghouse Saloon, Winners and Losers Bar & Grill, FGL House, and Marriott Gaylord Opryland Resort. Jevo is the world’s only automated gelatin shot maker system, manufactured by U.S.-based Food + Beverage Innovations, LLC (F+BI). Jevo takes the 4-5 hr. messy labor-intensive process of making gelatin, down to minutes, all while focusing on serving up an amazing tasting and easy to consume Jevo gelatin shot, that guests love. The Jevo technology allows nightclubs, bars and restaurants to create delicious gelatin shots in minutes. 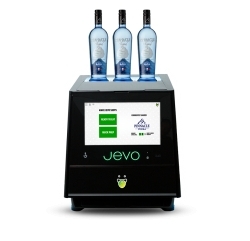 Bar staff simply insert a Jevo flavor pod, selects a spirit, and Jevo takes care of the rest. Jevo even tracks usage for automatic pod resupply, so staff never needs to worry about running out. From traditional flavors such as Cherry and Apple, to cocktail-inspired flavors like Margarita Limeville and Pina Colada, recipe possibilities are unlimited. The Jevo system’s consumables, which include flavor pods, shot cups and lids, are all recyclable. The team at Jevo has found that restaurant managers not only appreciate the product’s simplicity, but also its workhorse capacity to prepare up to 300 servings per hour. Product specialists also like to point out that the Jevo system’s precise pour capability helps operators control liquor costs and control over pouring all without compromising consistency. Jevo flavor pods are available in 11 flavors and they taste great with just about any spirit. Boone points out that with Jevo, customers are winning on both ends. It’s easier on staff, better for the bottom line, and provides guests a great shot experience. Nashville operators can learn more about Jevo by contacting Aaron at [email protected] and visit our website at www.getjevo.com.